ALL TOURS HAVE BEEN DISCONTINUED. Welcome to Ostrich Country. 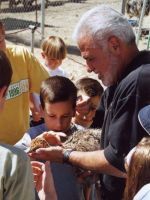 Indian Point Ostrich Ranch offers specific large Group tours for all ages including field trips, senior groups, agritourism or just a fun large family outing or reunion. Imagine getting an up-close and personal visit with the largest birds on Earth and learning about their characteristics, behaviour and husbandry. Special group packages are available. Bus and RV friendly. The ranch is located about 2 hours north of Los Angeles and 45 minutes southeast of Bakersfield in the Cummings Valley area of Tehachapi, California. Tehachapi is a four-season mountain-top community at a 4100 feet elevation and is well known for Ostrich, Wind farms, Apple Orchards, Wine Tasting the Railroad Loop and a world-class Action Sports Center. 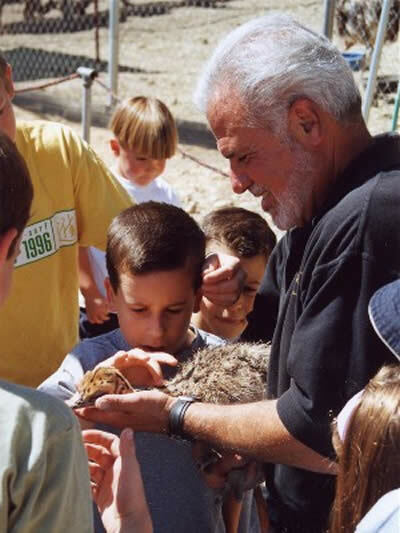 Here in Ostrich Country, we’re a field trip destination for thousands of children throughout Southern and Central California. Every year big yellow buses arrive at the ranch with anxious kids excited to learn about ostriches and play ostrich games. Kids love to be near the birds and are amazed at their dinosaur-like qualities. 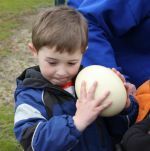 The children discover many fun things about ostriches including their impressive performance, incredible economics, and their health and cleanliness. 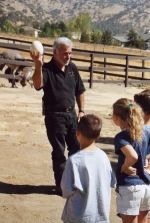 They will also receive an interactive demonstration on the hooding and handling of an ostrich. Imagine a child’s expression when holding their first ostrich egg. Their faces reveal an excitement that is truly amazing. 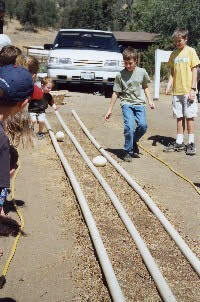 This activity creates a lasting impression for years to come. The students will enjoy games including the Ostrich Egg Race, Rooster Toss, Water Relay, and Playground (as time permits). The visit is complete with a trip to the Visitor Center where they can view an extraordinary ostrich display. An informative packet containing pre- and post-tour activities will be sent to the teacher prior to the field trip. This packet includes ostrich-themed facts, puzzles, poems, and coloring pages. Gift bags are available to purchase as keepsakes of the tour. These bags include an ostrich feather, eggshell, literature, and other fun goodies. Inquire about purchasing these bags when scheduling your tour. For reservations, contact Marcy at . Enjoy an interactive and educational tour in a beautiful rural setting. When he is available, the tour begins with a 35-40 minute humorous and informative talk given by Joel Brust. He talks about the Tehachapi area and gives an overview of the ostrich industry. Joel is a charismatic speaker and always enjoys involving the audience. A detailed guided breeder tour gives guests an opportunity to observe the ostriches up-close and in their natural environment. The guests may feed them if they choose. During the summer hatch season, chicks of many different sizes can be seen. Ostrich grow 1 foot in length per month and don’t stay small very long! The interactive visitor center is located in The Ostrich Nest gift shop where guests may see and touch eggs, feathers, and learn about healthy ostrich meat and products. The Ostrich Nest also has ostrich related items and features local art for purchase. We can accommodate large buses and RV’s. These incredible animals please everyone from Grandparents to Grandchildren. Schedule a tour or event for your family and receive the full treatment including an opportunity to play the Egg Roll game – a must for all first-time visitors. After 26 years we've discountinued our tour operation (Whew! we're tired). Our Blue Feather Ostrich Oil and other products are now available through Amazon. Routine Ranch operations and incubation continue as normal. 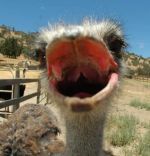 We usually have Ostrich of all ages including chicks for sale. We also have birds available in Northern California. Business visits are by appointment only. Contact: Joel 661-822-9131, Ext. 304.